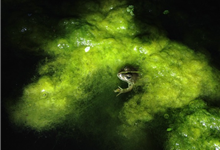 After a particularly cold snap, it finally feels like spring is on its way - a perfect time to get outside and look for signs of life in ponds and waterways. 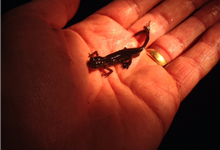 We are really excited to be hosting an Introduction to Native Amphibians on Thursday 15th March here at Bore Place, come and join us or take a torch out and go for a night walk. It's an ideal time to search the ground for frogs, toads and newts returning to their natal ponds (the ponds where they were born) to breed. A sure sign of warmer weather being just around the corner. There is a good chance that some of the eggs laid before last week will unfortunately have perished in the very low temperatures. 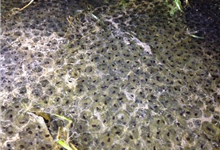 Amphibians, however, lay as many eggs as they can to ensure the best rate of success and hopefully some will have survived or new viable spawn will have been laid since it has warmed up. You should be able to identify what species the eggs are from. Frogs lay their eggs in clumps, toads lay theirs in strings and newts tend to lay their eggs singly onto leaves of plants like water mint. They then fold the leaves over to protect the eggs. 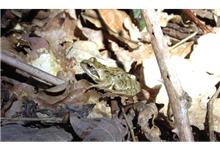 If you live near a pond then listen out for the croaking chorus of male frogs and toads trying to attract a mate, especially after dark. You can find out what they sound like here. 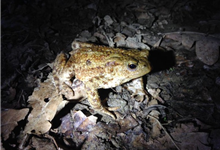 If you go out after dark why not follow your ears or scan the ground with a torch to find frogs and toads marching towards ponds, which they can travel over a kilometre to reach. Sadly, many toads and frogs lose their lives crossing roads on their way, so some people set up special toad and frog crossings at migration hotspots! Herons are quick to take advantage at this time of year of the concentration of amphibians. Keep an eye out for them hunting at the pond margins. 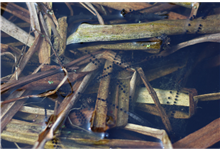 Contrary to popular opinion, most adult amphibians leave their ponds after breeding and spend the majority of their year on land so make the most of the season and see what you can find!